Following the "Sipat" peace talks between the rebel group led by Fr. Conrado balweg and the Republic of the Philippines, a public forum was held in Mt. Data, Bauko, Mt. Province to further resolve issues and concerns affecting the upland people. Here, photo shows Balweg in a light moment with Major Densen and Baboo Mondonedo. 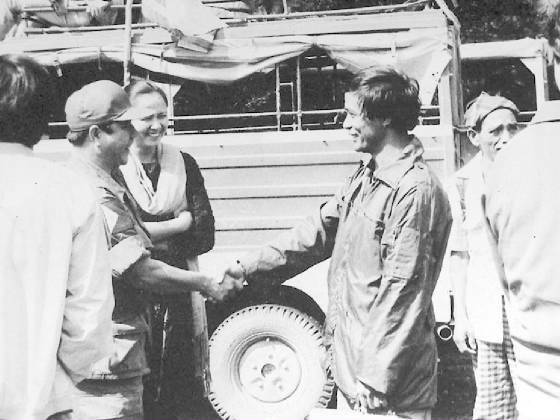 Photo shows CNA-TV Cameraman Art Tibaldo and CNA Co-founder Peppot Ilagan (now deceased) interviewing Sagada residents on how insurgents in the countryside affected them. Having no daily deadline to beat, the CNA-TV team can spend more quality time with their subjects. PEPPOT was in high spirits when my daughter Tina and I visited him at the hospital last week. Although physically emaciated, he was intellectually spunky as ever. We talked of old times, and shared a good laugh over some of the things we used to do. He kept me up on current events, like Domci being exiled to Abatan because he wanted to drink more than his share of kickapoo joy juice and how Steve has issued a formal warning against all taxi drivers who address him "tatang" since he dyed his hair black. He said Steve promised to deliver a roundhouse right to any taxi driver who tells him, "Papanan tayo, tatang?" Maybe he should dye his hair yellow instead, wear an earring on the left ear and sport a tattoo on his biceps. Then he would be properly addressed in more juvenile terms. This is an indication that we in the Baguio Correspondents and Broadcasters Club who were active journalists during the decade of the 70s suffer a severe psychological hang-up over the fact that we are now senior citizens. I myself am a grandfather three times over, but I still cringe when the vegetable vendor admonishes me, "Kurenta laeng dayta, tata." The TV was switched on to CNN with Larry King on board, and I told him I once applied for a job at a TV station but was turned down apparently because of my advancing age and an excess of qualifications and experience. "Gosh," I said, "I'm much, much younger than Larry King!" We both disapproved at how newscasts are now being aired and the manner in which the anchor delivered it - as if the fires of hell were licking the kitchen floor. We both snickered. The anchors were not delivering the news, they were yelling it. He urged me to write again - something which I haven't don since becoming features editor of a newspaper in Jeddah in 1990. I had all the excuses: I have writer's block, I can't breathe, my back is aching and I've got to wash the dishes. "No, George," he said. "It's time you started writing again." Come to think of it, that's the primary reason why I'm writing this piece. Like most writers, Peppot knew the sense of fulfillment that comes after producing a creative piece. Shortly before I left the hospital, I gave him a novena from my wife, who gave express instructions that Peppot could request masses so he can receive Holy Communion regularly. "I used to do that," he said. "I believe in the power of prayer." Eyes misting, he told me of the time his wife was down to the last 200 bucks and they had to pay an enormous hospital bill. There was nowhere to find the cash. Out of the blue comes Herr Bautista with a check that covered more than the hospital expenses. He also spoke of the help extended by the Baguio media and his many friends here and his relatives abroad. By the way, it was at the instance of Maribeth, Peppot's sister-in-law who had just arrived from the States, that I saw Peppot. I had just begun to putter around after being bedridden for one month. I remember Peppot most vividly in the closing years of the sixties and the decade of the seventies. Marcos had just written finis to my career as a sportswriter for the venerable Philippines Herald in Manila and I was then news director of radio station dwHB along Assumption Road. 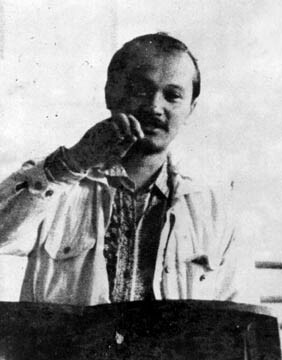 Peppot was in his prime as a student activist, a calling he shared with his sister Portia. It was his idealism that gave him the impetus to dive into journalism. In one of our sober tête-à-têtes, I told him he couldn't lick the establishment, so he may as well join it. Together with Willy Cacdac and Joe Dacawi, he worked with Bert Floresca and Des Bautista at the Focus with Steve Hamada at the Midland Courier, then with the Gold Ore until he became its editor. He never hid the fact that his ideology was left-of-center. His journalism, however, was the plain and simple search for truth. During those years, Peppot hung around with a motley group of rowdy newsmen that included Abe Belena, Gerry "Boo" Evangelista, Nathan Alcantara, Jimmy Laking, Steve Hamada, Bembo Afable and the "Katzenjammer Kids," Domci Cimatu and my brother Andrew. Save for Belena, none had a formal training in journalism. But all were hard-nosed graduates of what I call the University of Hard Knocks. They sometimes acted like naughty high school kids out on a summer break, but they wrote their pieces like men, which is what really mattered. They naturally gravitated to dwHB since it was in the center of town and I was a convenient excuse. I was the only one who was married and had a family, and their mothers probably thought I was a safe enough person to be with. When I became station manager and BCBC president, the made the station not only their clubhouse and bar, but official home of the homeless BCBC. Peppot even had a radio program with his fellow activities and I nearly lost my job when he sang the "Internationale" in one program. The country was then under Martial Law. When they had petty cash in their pockets, the venue changed to Udyong's along Carantes Street. Gin was then one peso per shot. Everyone drank his fill following a Marxist dictum: From each according to his abilities, to each according to his needs. You could just imagine the scene if it were payday. Udyong Limpin as since stopped serving gin... which reminds me: What is the difference between hydrogen and oxygen? Oxygen is pure gin. Hydrogen is one part water and one part gin. Remember the Jun Labo jokes that antedated the Eraptions? Many of them were born at Udyong's and Peppot was part of their spontaneous production. For the record though, these were all antedated by Kiangan jokes. Ask Nars Padilla and Mon Dacawi - him of the lost tribe. One joke was even reserved for Sid Chammag, God bless his soul. Chammag had one too many so he sat on the sidewalk near Dainty Restaurant. His world was furiously turning around and around . . . "Uhrrm . . . nabartekak." Along came a policeman who poked him smartly on the ribs with his bill. "Hoy, ania ti araramidem dita?" "Sir, ur-urayek nga lumabas diay balaymi!" Ti panagpanunot ni Chammag, no limmabas diay balayda ket sumagpat laengen. Isupay nga bayad ti taxi. I could go on and on, but my memory lapses are getting more frequent. Peppot loved a good joke and appreciated a well-placed pu. And I would like to conclude on this happy note. Fare thee well, my friend, and Godspeed. Maybe I'll see you soon. 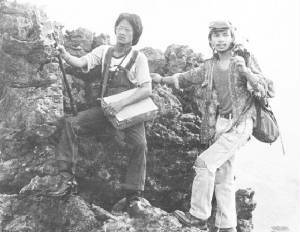 CNA-TV's cameraman and Technical Director Art Tibaldo is a seasoned mountaineer shown here as an independent filmmaker in the early 80's. 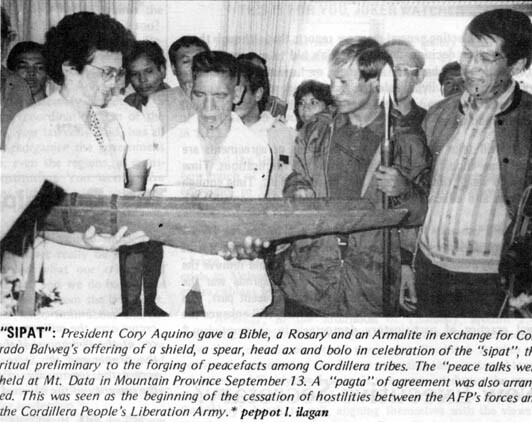 Cultural differences, land tenure, socio-political concerns and other issues related to the upland people's way of life cried for national understanding and intervention that the CNA, a small media organization felt obliged to serve as a conduit between imperial Manila and the tribesfolk of the Cordillera. Above photo shows the Fr. 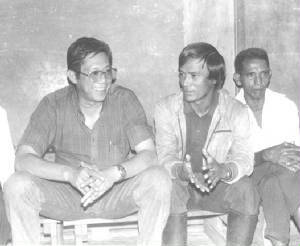 Conrado Balweg, (the erstwhile leader of the Cordillera People's Liberation Army) and Ama Mario Yag-ao (both deceased) together with other Igorot leaders during a consultation meeting at Mount Data, Bauko, Mt. Province sometime in 1987. Lower photo shows Agapito (Butz) Aquino during an initial dialogue with Fr. Balweg and Ama Yag-ao in one remote town in Cordillera. IF GOD has plans to put up a newspaper in Heaven and would need an editor-par-excellence to run it, He need not look further. Veteran journalist and former Councilor Jose Nicolas Ilagan, better known among his friends and to Baguio residents as Peppot, wrote -30- Monday morning after a six-month bout with diabetes and renal failure and may have already filled up that need. For years, Peppot had been an ardent advocate of community journalism. He started working as proofreader of the Black & White Printing Press in 1967 before he became editorial assistant of the now-defunct Focus news magazine then edited by the late Councilor Bert Floresca and published by the Bautista family of the University of Baguio fame. Even as he was just cutting his journalistic teeth, he already had clear insights into the issues and events unfolding in Baguio and in the rest of the Cordillera and wrote extensively about them. He subsequently moved on and joined the staff of the Gold Ore as editor-in-chief. His editorials and views in his column, Counterpoint, were among the most read pieces in the local scene. Born on January 20, 1948, Peppot, a dyed-in-the-wool Baguio boy, has touched the hearts of many people with his peculiar news stories, features, essays, columns and editorials, which are now a matter of public record. At a young age, Peppot already had inclinations towards journalism, gathering numerous awards as a writer during his elementary days at the Baguio Central School and then in high school at the Saint Louis University Boys' High. Peppot went on to study at the University of the Philippines College in Baguio where he took up political science, history and economics. He also pursued subjects in English literature at the University of Baguio. 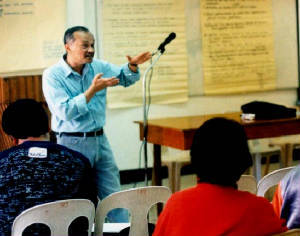 In recognition of his leadership in community journalism, Peppot was elected by his colleagues in media as president of the Baguio Correspondents & Broadcasters Club way back in the 70s. Following the fall of the martial law regime of Ferdinand Marcos, Peppot was appointed as OIC City Councilor in 1986, serving as such with distinction until after the elections in 1987. After his stint in the City Council, Peppot returned to his first love, journalism. He was one of the mediamen who came up with the multi-awarded Eco-Walk environment awareness program for school children. Peppot is survived by his wife, Laarni, and his two sons, Sam-ang, 4, and Talek, 1. His body lies in state at the La Funeraria Paz. His burial was tentatively set for Saturday, March 22.